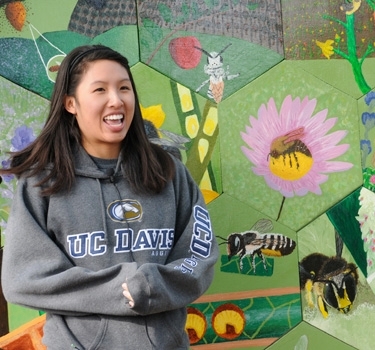 When you visit the UC Davis Department of Entomology and Nematology's bee garden--named the Häagen-Dazs Honey Bee Haven after its primary donor--be sure to check out the colorful mural on the shed. 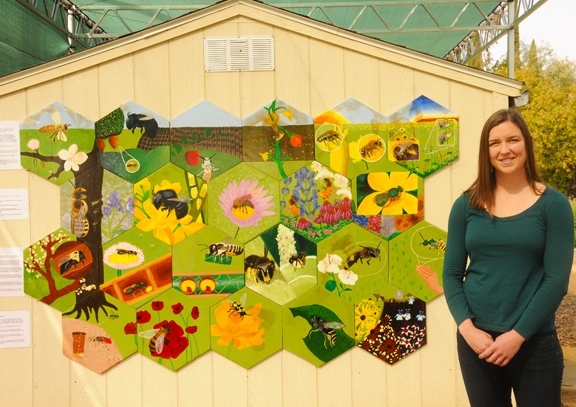 The panels feature mostly native bees. 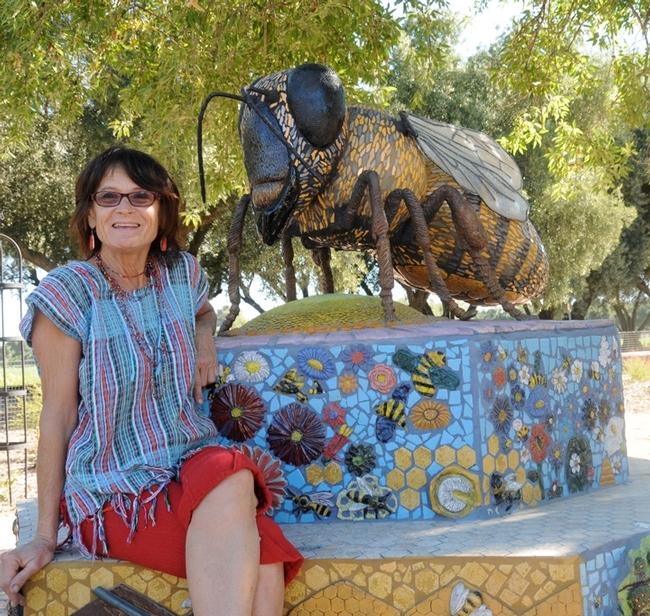 The project dates back to 2011 when 22 UC Davis students enrolled in an Entomology 1 class, "Art, Science and the World of Insects," taught by entomologist-artist Diane Ullman, professor of entomology at UC Davis and self-described "rock artist" Donna Billick of Davis. 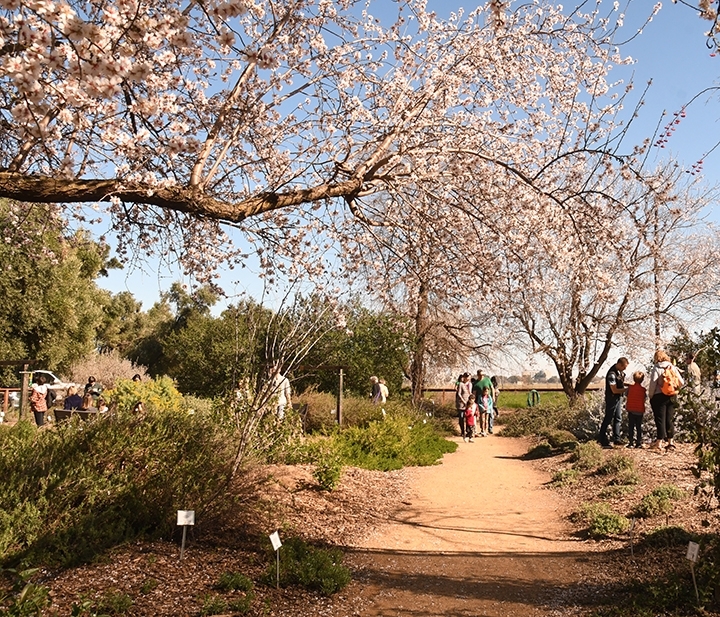 The half-acre bee garden, located on Bee Biology Road, next to the Harry H. Laidlaw Jr. Honey Bee Research Facility on Bee Biology Road is open from sunrise to sunset for self-guided tours. No admission is charged. The latest news: The Haven will now be staffed every Friday morning from 10 to noon. 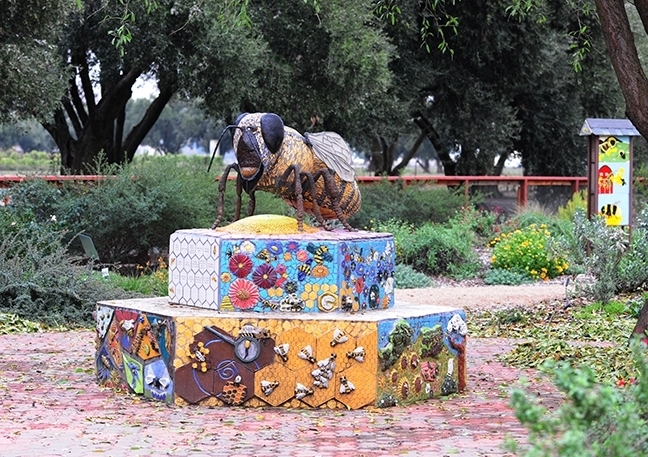 You can not only see pollinators foraging on the plants, but view all the art, including Billick's six-foot-long mosaic/ceramic sculpture, "Miss Bee Haven," that anchors the garden. On Fridays, you can also see the bee display case, sign up for a "catch and release" bee vacuum, and buy bee guides and plants, according to the academic management officer Christine Casey. But back to the bee mural. Then doctoral student Sarah Dalrymple of the Rick Karban lab, served as the graphics project coordinator and teaching assistant, guiding the students on design, creation and installation of the panels. She went on to be named the 2011 recipient of the UC Davis Outstanding Graduate Student Teaching Award and praised for fusing the boundaries of biology, art and culture. The 22 students portrayed 22 bees, including such natives as mason, sweat, squash, leafcutter, blue orchard, carpenter and bumble bees. Notice that the honey bee is not listed? That's because it's not a native. European colonists brought it to America in 1622, and it wasn't introduced to California until 1853. Another non-native is the European wool carder bee, first detected in the United States (New York) in 1963, and in California (Sunnyvale) in 2007. 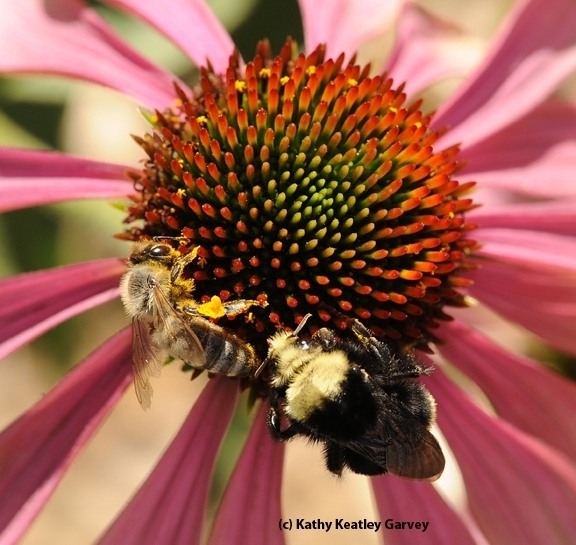 The carder bee is so named because the female "cards" fuzz from plants for her nest. The students celebrated their work and talked about their projects at an end-of-the-year gathering in 2011. And now visitors to the garden can celebrate--and appreciate--all the dedication, ingenuity and creativity that went into this mural. 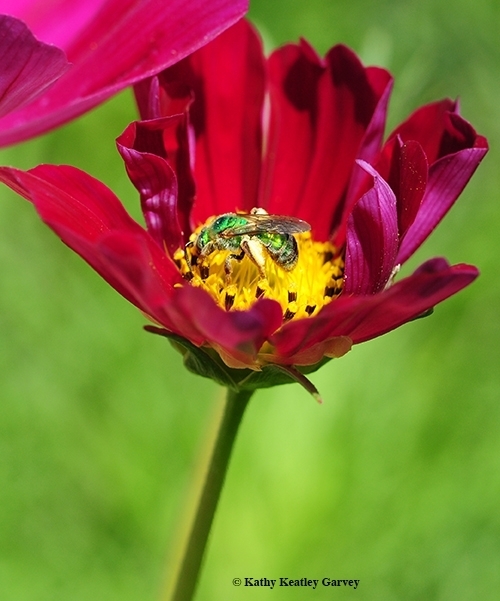 Let's celebrate National Pollinator Week. 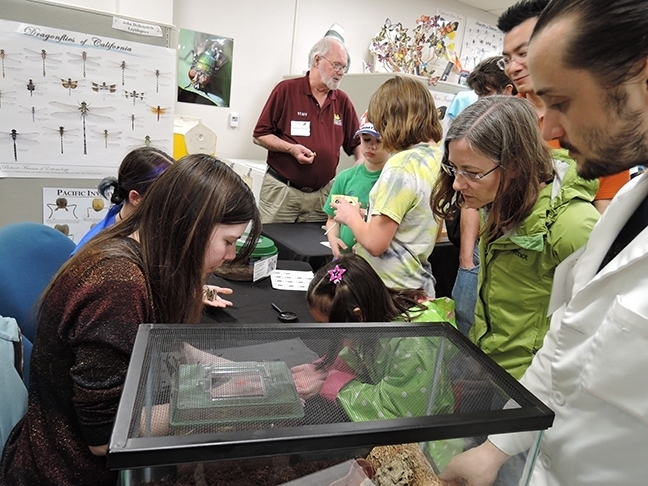 And what better time for the UC Davis Department of Entomology and Nematology to host an open house than during National Pollinator Week? 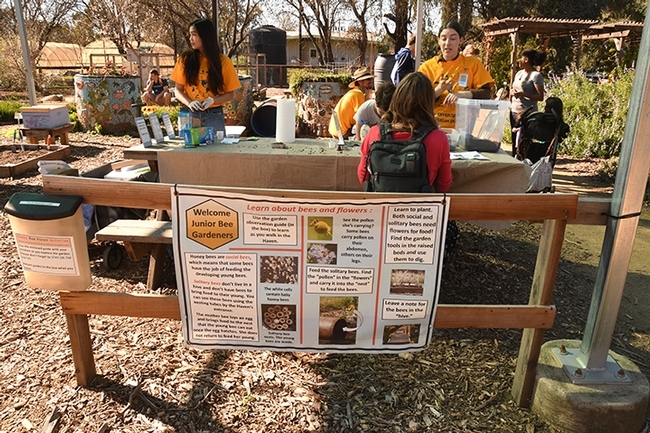 It's from 11 a.m. to 2 p.m., Saturday, June 23 at its bee garden, Häagen-Dazs Honey Bee Haven, located on Bee Biology Road, west of the central UC Davis campus. 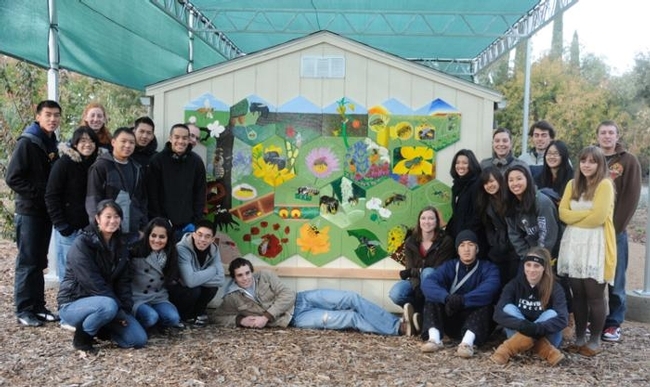 A Little History: The Häagen-Dazs Honey Bee Haven, installed in the fall of 2009 and located next to the Harry H. Laidlaw Jr. Honey Bee Research Facility on Bee Biology Road, off Hopkins Road, is a half-acre garden devoted to bee pollinator conservation and education. It was founded and sprang to life during the term of interim department chair, Professor Lynn Kimsey, director of the Bohart Museum of Entomology, who coordinated the entire project. Today. Extension apiculturist Elina Lastro Niño, member of the UC Davis Department of Entomology and Nematology faculty, serves as the faculty advisor and director of the garden. Staff member Christine Casey is the academic program management officer. 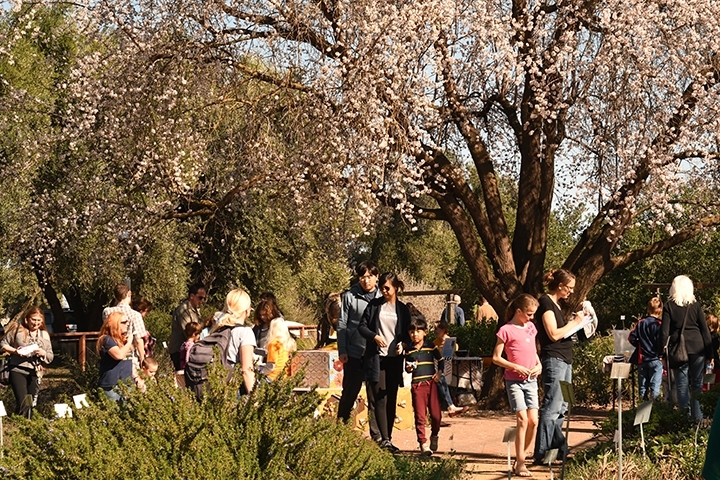 Native pollinator specialist Robbin Thorp, distinguished emeritus professor of entomology, plays a key role in the garden. 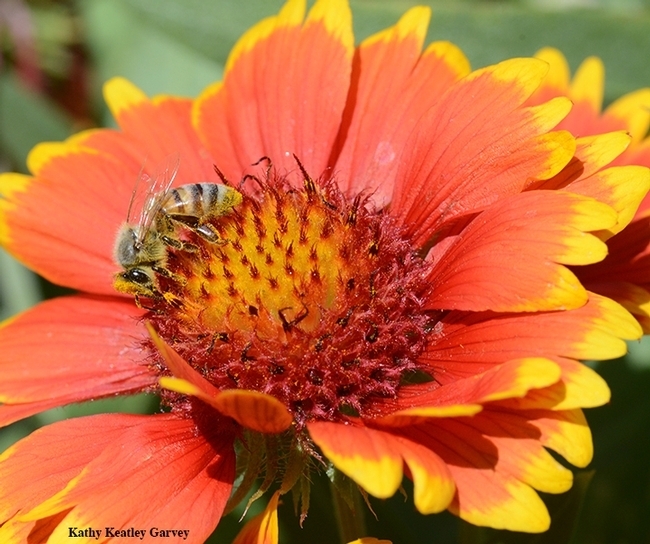 Thorp has recorded more than 80 species of bees foraging in the garden since 2009. He is the co-author of Bumble Bees of North America: An Identification Guide (Princeton University Press) and California Bees and Blooms: A Guide for Gardeners and Naturalists (Heyday). 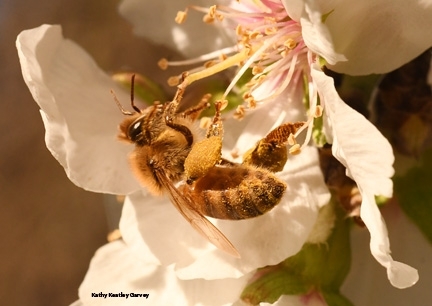 Of the 20,000 bee species identified worldwide, some 4000 are found in the United States, and 1600 in California. A professor renowned for bridging art and science will address a UC Davis Wildlife, Fish and Conservation Biology seminar on April 25 in Meyer Hall, UC Davis campus. 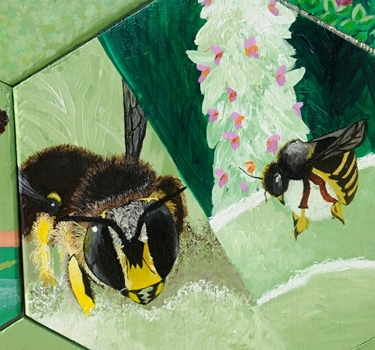 Entomologist/artist Diane Ullman of the UC Davis Department of Entomology and Nematology will speak on “Winds of Change: Bridging Art and Science” from 3:45 to 5 p.m. in the Room 1138, also known as "The Foster Room." 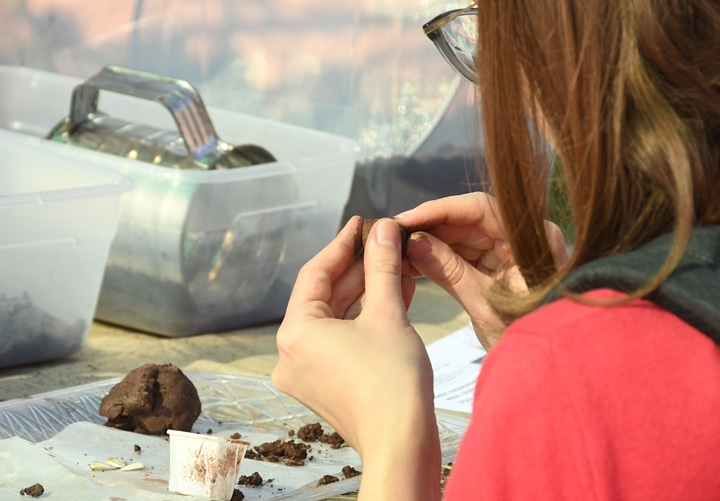 Ullman, co-founder and co-director of the UC Davis Art/Science Fusion Program, will describe the building blocks, innovations and outcomes of the program that she and nationally known ceramicist Donna Billick of Davis formed in 2006. Ullman and Billick created the art/science fusion concept in 1997 with the introduction of an undergraduate course, “Art, Science and the World of Insects,” that became the centerpiece and inspiration for the UC Davis Art/Science Fusion Program. Since then, the program “has been a hot bed of innovation, bridging art and science with diverse undergraduate courses, exhibitions, performances and colloquia with collaboration among design faculty, science faculty, museum educators, professors artists and UC Davis students,” Ullman related. One of the their most noted works is Nature's Gallery, a mosaic mural in the Ruth Storer Gardens, UC Davis Arboretum, off Garrod Drive. 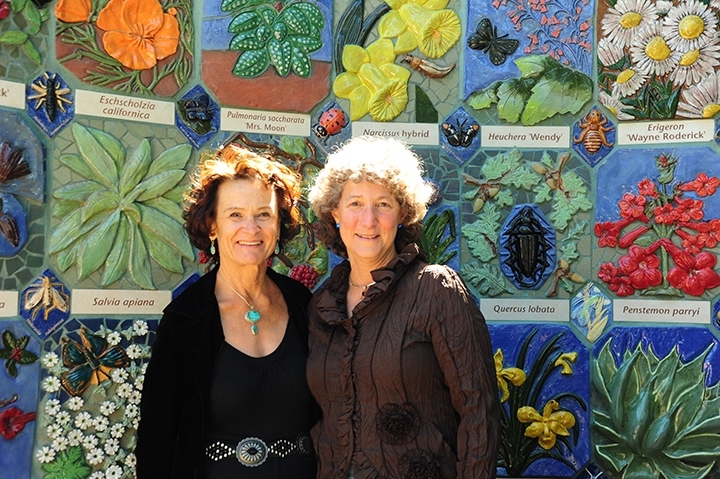 Handcrafted by UC Davis staff, faculty and community members, under the umbrella of the UC Davis Art/Science Fusion Program, it features interlocking tiles showing the diversity of plants and insects in California. 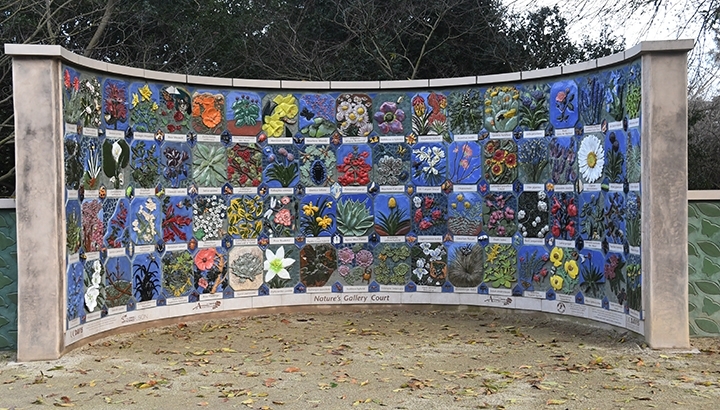 The 140 ceramic tiles depict plants and insects. 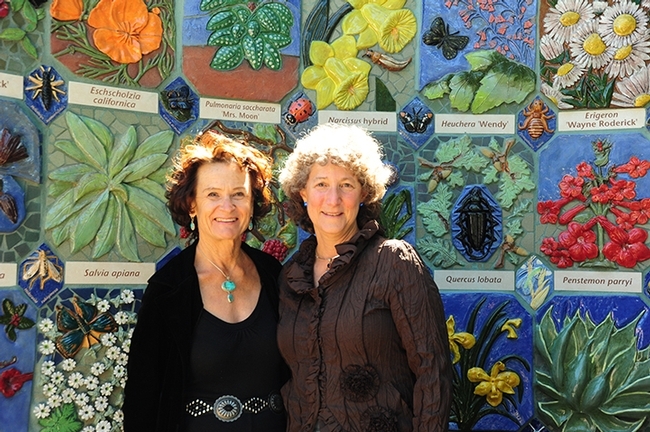 The mosaic mural drew more than 300,000 visitors when it was displayed in the summer of 2007 in the U.S. Botanic Garden on the Capitol Mall, Washington, D.C.
Ullman, both a noted entomologist and a talented artist, will relate how the UC Davis Art/Science Fusion Program was developed, why the connections between art and science can be transformational to teaching in both formal and informal settings, and how community inspirations and educational infrastructure are needed to succeed. “As the winds of change moved across the landscape, bridges between visual and performing arts, design, science and technology were built and programs around this concept have arisen worldwide,” Ullman noted. The settings and circumstances growing from this intellectual borderland yielded many unexpected outcomes that Ullman will share in her presentation. Ullman, who holds a bachelor's degree in horticulture from the University of Arizona, Tucson, and a doctorate in entomology from UC Davis, joined the UC Davis entomology faculty in 1991, after serving on the faculty of the University of Hawaii. 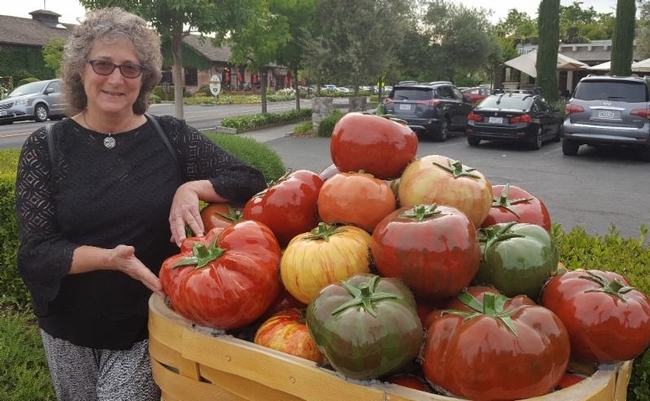 She chaired the UC Davis Department of Entomology from 2004 to 2005, and then served as associate dean for undergraduate academic programs, UC Davis College of Agricultural and Environmental Sciences, from 2005 to 2014. Ullman focuses her research on insect/virus/plant interactions and the development of management strategies for insect-transmitted plant pathogens. 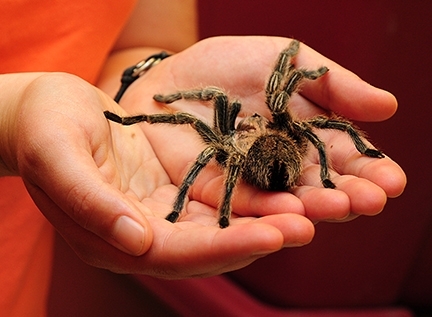 She teaches undergraduate and graduate courses in entomology and the Science and Society Program. A fellow of the American Association for the Advancement of Science and the Entomological Society of America, the UC Davis professor received the 2014 Excellence in Teaching Award from the Entomological Society of America and the UC Davis Chancellor's Achievement Award for Diversity and Community in 2007. It was heaven in the bee haven. As temperatures climbed into the seventies last Saturday, honey bees foraged in the California native plant, Brandegee's sage (Salvia brandegeei). 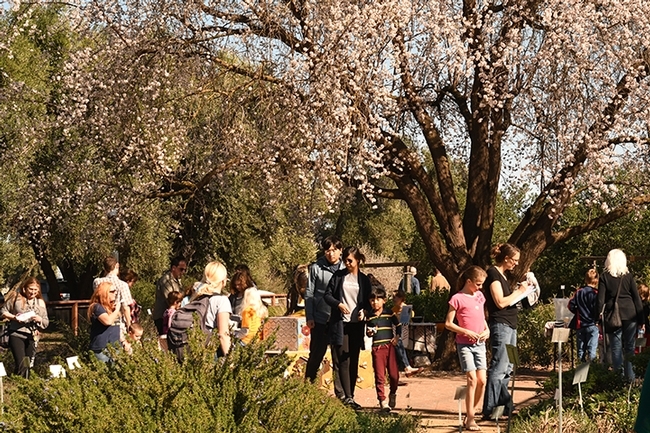 and pollinated the almond blossoms. Nearly 600 visitors crowded into the half-acre bee demonstration garden, the Häagen-Dazs Honey Bee Haven during the seventh annual UC Davis Biodioversity Museum Day. The haven was one of 13 museums or collections offering special activities. 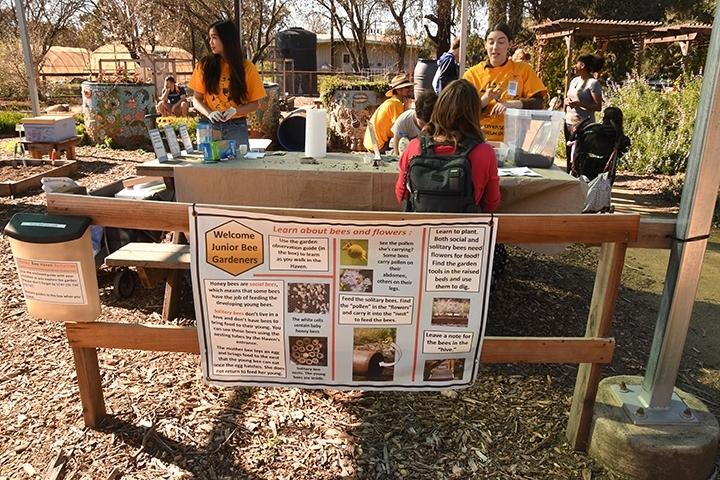 Visitors learned about bees, engaged in a catch-and-release bee activity with a vacuum device and made "feed-the-bees" seed cookies to take home. The haven, part of the UC Davis Department of Entomology and Nematology, is located on Bee Biology Road, next to the Harry H. Laidlaw Jr. Honey Bee Research Facility. A six-foot-long bee sculpture, Miss Beehaven, by artist Donna Billick, co-founder and co-director of the UC Davis Art/Science Fusion Program, anchors the garden. Other art, coordinated by entomology professor Diana Ullman, co-founder and director of the Art/Science Fusion Program, and Billick, also graces the garden. The haven, installed in the fall of 2009, was named for its principal donor, the premium ice cream brand, Häagen-Dazs. Extension apiculturist Elina Lastro Niño of the UC Davis Department of Entomology and Nematology serves as the faculty director of the haven, and Christine Casey, academic program management officer, serves as the staff manager. 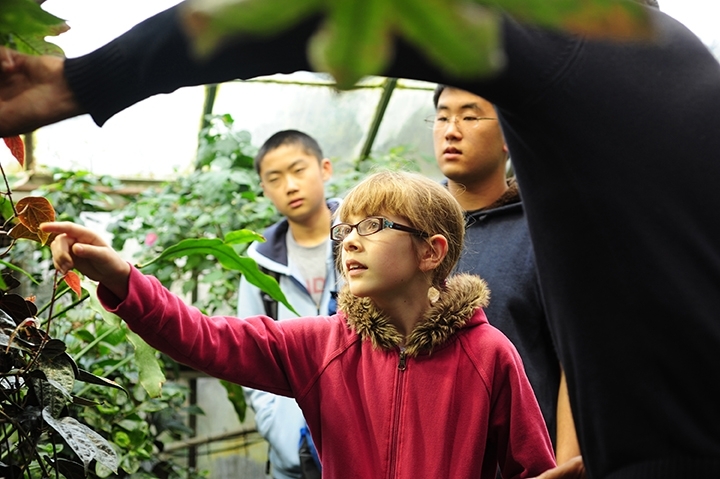 Oh, the wonders you'll see at the sixth annual UC Davis Biodiversity Museum Day! It's sort of like the wonders of the world but this is a science-based event at UC Davis. Scheduled Saturday, Feb. 18, it's a special day for the public to go behind the scenes to see 12 collections and learn how scientists conduct research. You'll gain first-hand knowledge. You'll see everything from honey bees to hawks, and from bugs to botanical displays. 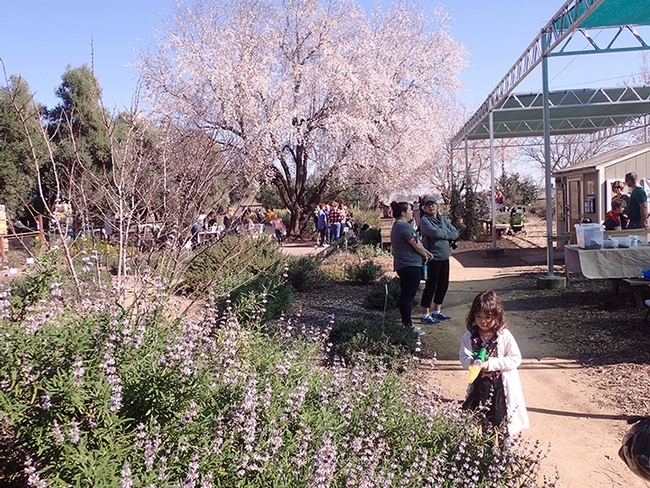 The event, open from 9 a.m. to 4 p.m., will "showcase natural history, biodiversity and the cultural-ecological interface," said coordinator Tabatha Yang, education and outreach coordinator for the Bohart Museum of Entomology. All participating museums and collections have active education and outreach programs, Yang said, but the collections are not always accessible to the public. In the event of rain, alternative locations are planned for the outdoor sites. 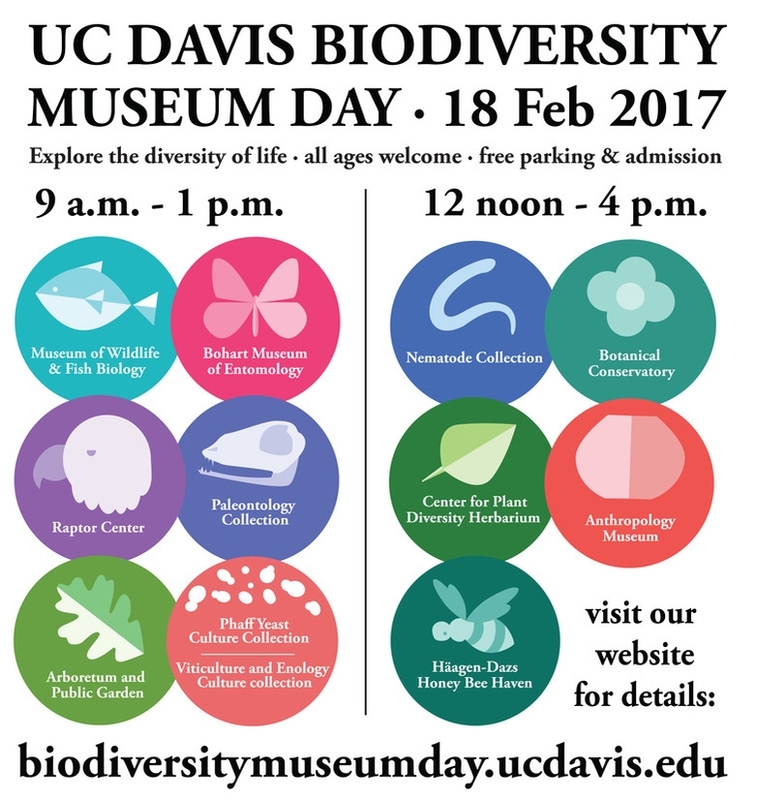 Maps, signs and guides will be available at all the collections, online, and on social media, including Facebook and Twitter, @BioDivDay. For further information about the event, access the UC Davis Biodiversity Museum Day website.